As I continue to learn XAML and Windows 8.1 phone development, I find some things great, while other things that should be fairly simple, difficult to get going outside of Microsoft’s canned examples. An example of this was learning to “design-time” data bind. For those of you not from the WPF world and are learning along the way to create a great app, “design-time” allows you to see a pretty good idea of what your application screen is going to look like with real data in real time without compiling your backend code and running the application. This can be very helpful especially when the project is getting larger and longer to build or you have a dedicated designer and he wants to make sure his minor changes look how they want it to look. Problem is, there are very few good articles on doing this properly and many of them either fall short on explanation or completing the tutorial with a working project. I’m not a big fan of either. It’s part of why I don’t blog as much as I’d like to. I feel if I do not have enough time to provide a detailed explanation of either my tutorial or development style, I really shouldn’t be writing it until I do. What Storage Type to Use for Design Time Data? The one thing I can see being useful, is if you will be using that same format to retrieve your data. For example, if your application gets information from a RESTFul service, chances are it has a JSON API. In that case, you may want to have your sample data come from a local JSON file resource within the project because then you can use the code you used to retrieve the data in the sample data classes to retrieve the real data from the RESTFul service. All you would have to do is change the location the code would retrieve the data from. In our case, we will be using a XAML file because it is honestly the simplest to get going and I found JSON to have a little more to it while I was trying to understand the data binding concepts. Since this is for people just learning, I’ll stick with KISS method. Interestingly, Visual Studio has a sister application for designers called Expression Blend. 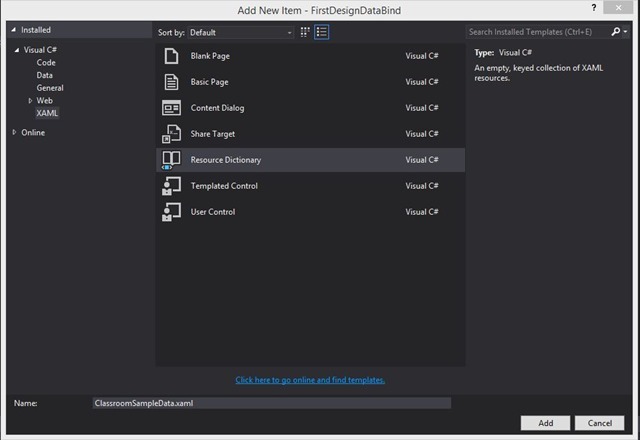 This application although best fit for designers, also provides developers a way to make simple changes to the UI and the changes will show up in Visual Studio immediately. I won’t go into the specifics in this blog post, but using Expression Blend, you can create sample data (dummy data) and bind it to the XAML. In this tutorial, I will be skipping this and just data binding from a developers perspective to save time. 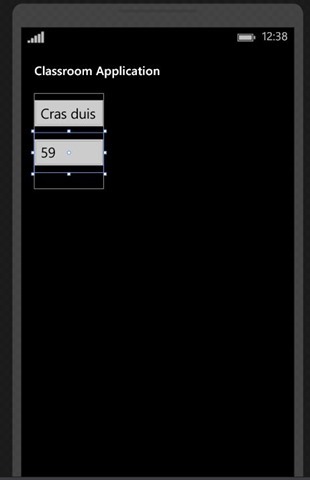 First open Visual Studio and Click File->New Project –> Windows Phone Apps –> Blank App. Call the application FirstDesignDataBind. You will notice that like any other Template for Windows Phone 8.1, there is a MainPage.xaml. This page is where we will be binding the sample data. Just as a side note, sample data is often referred to as Mock or Fake data in software development. They are pretty basic classes and in design mode there is no need for any property observables for UI updates, so to keep things simple, I did not add them. The next step is to add the xaml file that the design data will come from. To do this, you can right click on the project and Select Add -> New Item –> XAML -> Resource Dictionary. Call the file ClassroomSampleData.xaml This will create a basic XAML file without any backing code behind so that the data file is very light weight. The final update is to our MainPage.xaml. In this tutorial, because we are only discussing “design” data, we will not be concerned with the code behind. The above code creates a Pivot control and binds our data to a PivotItem template using a ListView control. What an ItemTemplate does, is alows you to define a template of controls and layouts that the parent control (ListView in this case) must implement. In this case, to keep things simple and obvious in the design view, we are using two StackPanels and two TextBoxes to layout and display the FullName and Age properties of the Student list. There are several important lines of code that should be pointed out. The top line is to allow you to dynamically bind for the runtime data. This is not required, but recommended practice, so I added it. 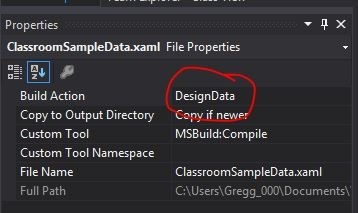 The next line, binds the Design DataContext to the XAML source we created that contains the data we bind to. Anything that has a d: prefix has to do with the design time data. Phew.. This turned out to be quite the post. I hope this helps other developers learning MVVM designs learn and understand how design time development works. This entry was posted in .NET, .NET 4.5, C#, Classes, Coding standards, Computer Technology, Data Binding, Data Mapping, Design Binding, Generics, Programming, Programming Paradims, Views, Windows Phone, Windows Store Apps and tagged .NET, .NET 4.5, .NET 4.5.classes, data binding, windows 8.1, windows phone, windows store apps. Bookmark the permalink.